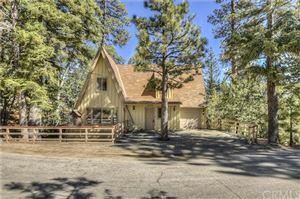 Fawnskin – Homes for Sale in Big Bear Lake, CA. Fawnskin is an unincorporated community in San Bernardino County, California. Its altitude is 6,827 feet. The community has a post office, which was established on May 18, 1918. The Zip code for the area is 92333. The small township was once an artists' colony, which attracted artisans, musicians, composers and actors from the Los Angeles area. Mountain travelers in the 19th century came to the Big Bear Valley through Fawnskin on the rough road by stagecoach and later motorcars. Gold miners, loggers, and hunters were drawn to the adjacent Holcomb Valley during the 19th century. The Native American legend about how the town got its name has been turned into the urban legend. The Anglo version is that hunters discovered deer (fawn) skins stretched out to dry in the sun. Hence, the area became known as Fawn Skin and later Fawnskin. Fawnskin has two public boat launch ramps to Big Bear Lake, various access points to the National Forest (Woodland Interpretive Trail, Cougar Crest Trail, Gray's Peak), the Alpine Pedal Path, as well as the Big Bear Discovery Center. The town also claims the only "honest" election in the nation. Anyone can vote for the Fawnskin Mayor; votes are donations of a quarter. The candidate who wins is the one who raises the most money. Hence, the town "buys" their politicians. Today, Fawnskin is designated as a protective habitat for golden and American bald eagles. They return annually to the valley from November to April.